Back during my undergrad years, I took a class called ‘Survey of American Literature II.’ We covered everyone from Whitman to Ginsberg and beyond. The professor was a lively, animated guy and his literary analysis was all but awe-inspiring, holding us all rapt with attention, our books opened, our pencils poised. By semester’s end I had only one complaint with the course. We ‘d completely grazed over the poetry of Carl Sandburg. 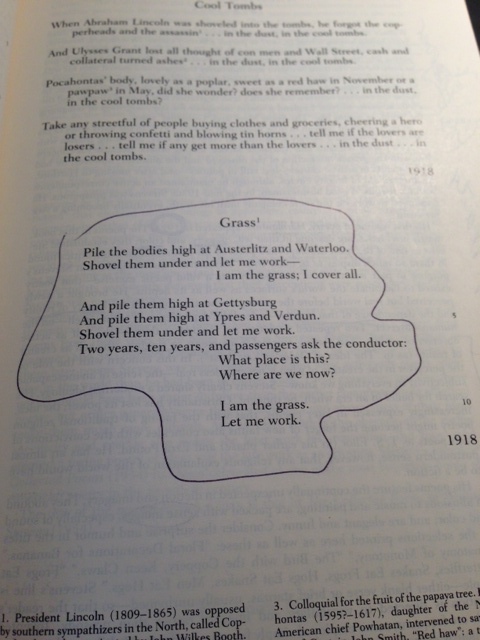 This afternoon in fact, having dusted off the front cover of my old Norton Anthology, I saw that only one of Sandburg’s poems, “Grass,” had been covered in the American lit class. I know this because I circled it—in the shape of the poem’s format, no less—in the book. It goes on to mention Gettysburg, Ypres, and Verdun—all names of famous battlefields in various wars. What a telling—if not morbid—way to describe the function of grass. But today I’m focusing another tiny, but pensive poem in the Sandburg section of my former college text. The poem was untouched that semester, but I can remember wishing we’d discussed it at length. Sandburg was known to be a plain-spoken poet, who in his own words wrote, “Simple poems for simple people.” Some call him an early forefather to the Beat poetry movement. His words don’t contain hidden allusions or tricky metaphors. Sandburg was a straight shooter. No rigmarole found here. I wonder then, if we’re meant to take “Fog” as it is—a fleeting image of a common weather pattern. Truthfully, I find that difficult to accept. I’ve been wired to make literary analyses; it’s what I do. So after picking the thing apart, I’ve come up with my own interpretation. Cat: transitory, feminine, solitary, often symbolized or associated with sorcery, magic, etc. Another thing about fog is that it is temporary. It comes, stays a while, and then dissipates. Cats too, often appear and disappear in an almost uncanny way. The use of the word “haunches,” which clearly parallels to the way that cats actually sit is suggestive of the stooping way in which the fog hangs. And of course here, the fog is hanging over a harbor—a place for rest, a place for peace. To me fog will forever symbolize a lack of clarity. I see this harbor as human consciousness that has been temporarily befuddled by the haziness of the fog. We all face periods of confusion and indecision in life, and in those moments our visions and hopes can seem cloudy, indecipherable, and unclear. But these situations often have a way of lifting themselves, of dispersing at the source. We work out our problems. We seek advice. We pray. We move in different directions. We make decisions. Little by little, our concerns take care of themselves. They have to after all, because just like the fog, if they don’t eventually fade away, we’d never make it through. Do you have a different interpretation? Well, Faulkner, that’s my problem these days. I can never tell when I’m finished. The other problem is, I always think I can express it better. For me, my already written text is like an iceberg–stands in the way, won’t move, won’t budge, actually, and blocks a calm, smooth sail. It’s a crutch, a challenge, a ‘hard place,’ if you will. The other night I dreamed I was sitting in a park on a bench as day gradually turned to night. At one point I thought to myself, ‘Hmm, it’s dark, maybe I should get up and go.’ I began to feel spooked actually, so I got to my feet, and strolled over towards another bench, where apparently all my stuff was: my school bag, my purse, and, oddly, a small, brown dog. I fumbled around aimlessly, trying to collect my items as the duskiness of night set in. I don’t have a dog. I’ve never seen this one in my life. But I picked him up, along with my other (less furry) cumbersome items and began to walk. Then I was walking down my grandparents’ street–towards their house, I suppose–and the world began to light up again, gradually, in degrees. I still held onto my things, dog included, but I felt resolute in making it all the way to my grandparents’ house without dropping anything. All my dream research points to darkness as a sign of doom, evil, the death of the spirit. But I don’t think I believe that–not in this context anyway. I think I’m ‘in the dark,’ about what my writing should look like, should sound like, etc. I’m fumbling around, trying to figure it all out. I’m determined to hold on, to make it back, and little by little, the fog–or darkness, in this case–will dissipate. I don’t think anything I’ve ever written is perfect. I don’t know if I’ll ever be able to tell. If there is even such a thing as ‘perfect writing.’ I’ll keep aiming for perfection; maybe one day I can get close.